Antonio Rudiger’s agent may well have created a new storm at Chelsea after his deleted tweet called for Cesar Azpilicueta to be replaced as captain. The Blues were involved in a controversial moment during the Carabao Cup Final on Sunday at Wembley, with goalkeeper Kepa Arrizabalaga refusing to come off. Both the Spaniard and coach Maurizio Sarri have since insisted that it was a breakdown in communication and a misunderstanding that led to him not being replaced by Willy Caballero, but he has been fined and could be dropped against Tottenham on Wednesday. If that wasn’t already enough for Chelsea to deal with and to put in the past, Rudiger’s agent has now reportedly suggested on social media that his client should be made captain instead of Cesar Azpilicueta, who also caught some criticism for not doing enough to sort out the situation. “I’m a fan of Azpi [Azpilicueta] but as captain he should never have allowed what happened with the GK [goalkeeper] refusing to come off to happen,” Saif Rubie is said to have tweeted before deleting it, as per the Daily Star. 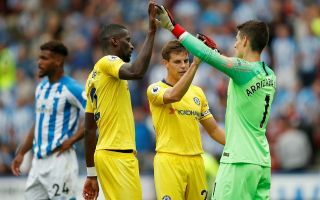 In fairness, it’s a good point as the Spaniard should have stepped up as a leader in the team to sort out the situation and forced Kepa off to listen to Sarri’s wishes. Instead, he even suggested after the game that he didn’t see what was happening on the sidelines. However, given the way in which Sarri has dealt with the Kepa situation, it’s unlikely anything will happen with Azpilicueta and the captain’s armband.